Heats up to 1000 sq ft.
New stainless steel diffusers produce 14% more heat than last years models. Comfort Furnace infrared heaters have a 3-year extended manufacturers warranty. Comfort Furnace infrared heaters have Solid-state Electronics No more mechanical contact switches or sensors to wear out. 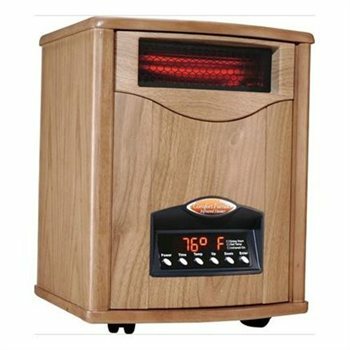 Comfort Furnace infrared heaters have a full function electronic Thermostat This new thermostat replaces the standard mechanical thermostat found on other brands. Provides sensitive control of room temperatures to 1 degree. Comfort Furnace infrared heaters have a Delayed Start Function you can delay when your heater turns on up to 23 hours from the time you set it which provides versatility and additional energy efficiency. Reduces energy consumption by 35% to 50%. Promotes healthier, cleaner air. Comfort Furnace heaters destroy bacteria, virus, mold, mildew and other organic organisms that cause respiratory distress, colds and flus. They are the perfect heating source for your home. Is a safe source of localized heat that cannot burn or harm pets, children, or furniture and does not give off solar radiation like conventional radiant heaters or dishes. Is portable so you can heat only the areas of your choice. You use less electricity to produce the same amount of heat. Is designed to last 15 20 years or more! Is available in 2 convenient sizes -1000 Watts and 1500 Watts.